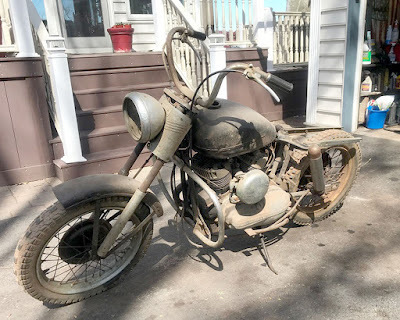 Every bike I've had pretty much started out like this. A box of stuff, missing about everything. My first bike was wrecked with broken cases. The next one was all apart, but most original H-D parts. From there on out, they were all in piles, or missing about everything 'cept the vital pieces. Above is the '54 Panhead. You sure learn a lot when you do it this way. Much more than a guy realizes . . . I could probably afford a complete bike now - but why start ? This is turning into a K Model Blog . . . I got a deep, dry basement. It's got neat rustic walls. I run a dehumidifier all summer so it stays dry. There's not much down there but a few folding tables where I keep some parts for future builds. I've sold all my parts (except for the K Model stuff, and a few spares). I never really had all that much for parts anyway. I've had these awhile. They were rusted, needed a bore job, a base was broken, and cooling fins were missing. One has now been sleeved. The fins repaired. The base repaired. They have new guides and new valves. The rusty, pitted valve seats have been ground and lapped. That plastic bag has the Eastern Motorcycle Parts spring spacers I'll use to set up the valve springs for a set of KK cams I have collected. These are nice spacers to use, since they have a small lip on top that fits into the valve spring and helps center it on the guide, and hold it in place. I'll measure my installed spring height, then subtract my cam lift (and .070). Then I'll subtract the length of my spring at coil bind. This will leave me with the proper length to make my spacer/shim for that particular valve. I used my Valve Spring Tester to check my springs, and I'll run the 2 strongest on the exhaust valves. These original 1948 heads had been "upgraded" to o-ring style. It wasn't a nice "upgrade" (if you get my drift?) Kinda cobbled. It took a little doin' .. . but we got the stock style plumber back in there, and used some sealer. Then we drilled holes, and manufactured our own mild steel rivets with factory style heads (after viewing photos). The rivets were press fitted, with sealer, and peened on the inside like stock. I painted the rivets with cast-iron-gray high heat. It's always a good idea to mock up these motors before you get too carried away with assembling parts for good. The cylinders didn't fit, requiring sanding, de-burring and plenty of aspirin and head scratching. It's nice if the cylinders can move on the base studs a bit when aligning the intake manifold. 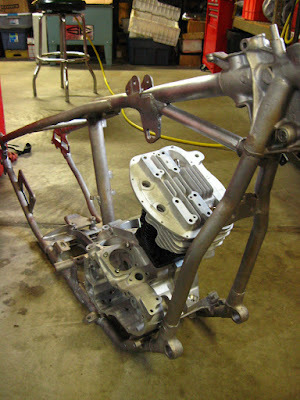 I'm building a 1956 KHK for my buddy Dave. I get boxes of parts in the mail from him. Sometimes I open the box, and the parts are totally trashed, greasy, dented, rusted and broken. Other times I open the box, and the parts are the most beautifully polished, original parts you've ever seen. They are so pretty you hate to touch them, and you have to be ultra careful not to scratch anything. This was one of the "shiny times" I opened the box. Now cleaning, checking threads, pressing and sizing bushings. When I go to a swap meet and I see original Harley-Davidson boxes, I always have to check 'em out. If the part number ends in -52, -54, -57 or -58 I get all excited ! Maybe an NOS Sportster part???? 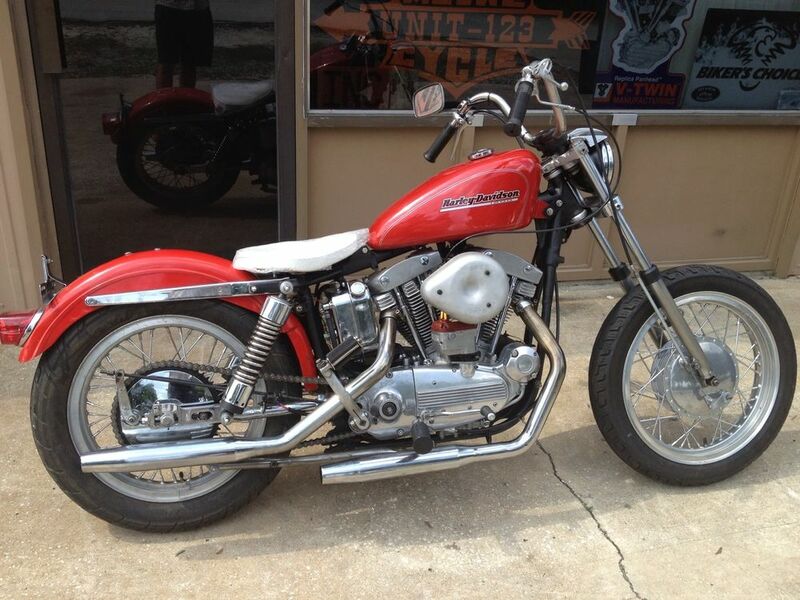 I like any original Harley part....especially the type of parts that "wear out" after awhile. If the part number ends in "P" I think it's a Sprint part (I call it). I found this one . 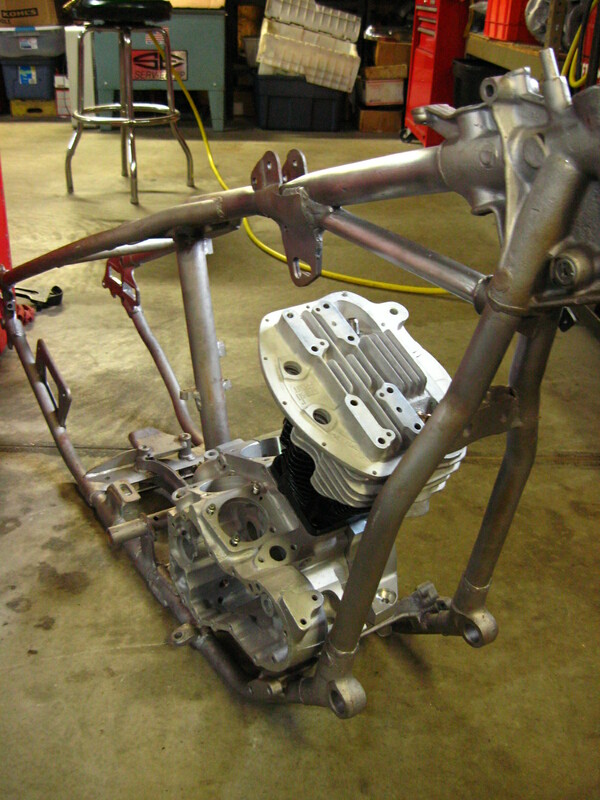 . . opened the box and had to make an offer on this original NOS Big Twin 4-Speed Kicker Gear. The price was right - and it went right-in-my-pocket. A guy can build an entire motorcycle after buying just one particular part that sets the stage - and taints your interest. Now I'll have to look for a nice transmission case, mainshaft, some gears . . . and build a transmission. Or just put it in a box until the one in my bike wears out? Probably a smarter thing to do . . .
Not mine...but most of my bikes looked like this when I got 'em - mostly worse. Just build all the old ironheads . . .
. . . to look like this. Every guy needs one. If it's a big city, or a small little town. For a quick flick through town, up the hill, down the alley . . . easy parking. Park it in the garage, in the shed next to the mower, or lean it against the fence (with a blue tarp over it). No battery. No Problems.